These photos are reallllllly old but I hope you don't mind me sharing them as I was really happy with this outfit! It was one of those outfits that I felt really great in. Mom jeans are so comfortable and so flattering on my figure (well I think so anyway) and the added height from the mules really helps. 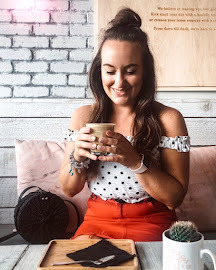 This blouse from Topshop was so popular (I have a blue spotty one featured here) and again is so flattering and I just love the colour of it - I need to pull this back out of my wardrobe and get some more wear out of it!